We’re passionate about connecting people with the beautiful, crackling flames of a fireplace, and we understand that it’s a personal experience that’s different for everyone. So we believe in tailoring our HearthCabinet Ventless Fireplaces to match the look and feel of your dream fireplace. Without the constraint of a chimney, new fireplace design ideas are possible, with unique opportunities for customization, indoors or outdoors. With outdoor living spaces becoming more popular and personal, we feel it should be the same for outdoor fireplaces. Now that the weather is getting warmer and we’re spending more time outside, it’s the perfect time to revisit the design and decor of your outdoor space. A fireplace on the patio is a wonderful amenity; more than any outdoor feature, a fireplace sets the scene for dining al fresco or enjoying a nightcap in the evening air. The flames add an unbeatable ambience with their comforting crackle and mesmerizing dance. HearthCabinet Ventless Fireplaces offer unique design opportunities: Not only do they require no chimney or connections of any kind, but they are also freestanding. Thanks to these features, HearthCabinets can be placed and secured down virtually anywhere. Imagine the design possibilities. In the beautiful Manhattan patio below, the HearthCabinet Ventless Fireplace has been placed in a stone surround. This surround is special, because it houses the ventless fireplace on one side and wraps around to house an outdoor grill on the other. This clever design is possible because the fireplace requires no chimney or connections, and the result is chic, contemporary, and space saving. See more of this project in the Wall Street Journal on our Press Page. HearthCabinet Ventless Fireplaces are free-standing, so they do not require a mantel or surround. In the Manhattan patio below, the fireplace has simply been placed and secured to the floor. The fireplace has been finished on the top with a slab of granite and boasts three open sides, so it can be enjoyed from all angles. 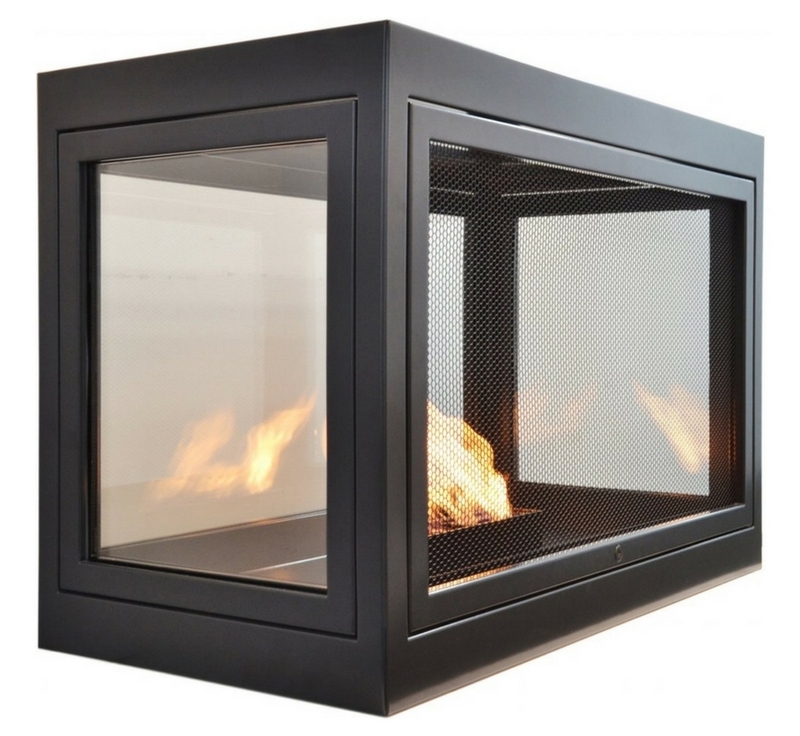 In addition to the 3-sided unit, our team has also designed HearthCabinet Ventless Fireplaces in 2- and 4-sided options. The 2-sided unit is the perfect choice for a space divider, bringing the cozy feel of a fireplace to each side of your space. With its 4 viewing sides, the Quadrant is a beautiful statement piece, perfectly at home in the center of your terrace. Our architect-led team of designers loves collaborating with fellow trade professionals to create the fireplace design of your dreams. From stainless steel to bronze to colorful powder coated steel as well as custom hand-applied finishes, we offer an array of choices that is sure to complement your space. To learn more about our custom and customizable, chimney-free fireplaces, visit our product pages. If you have questions about HearthCabinet™ Ventless Fireplaces or would like to speak with one of our experienced designers about your project, please give us a call at (212) 242-1485 or visit the Contact page. We’d also love to welcome you into our flagship Manhattan showroom in Chelsea, or make an appointment for you to see our ventless fireplaces in DC, Chicago, or Short Hills, New Jersey. Call us today! Published on April 26, 2017 by Hearth Staff.